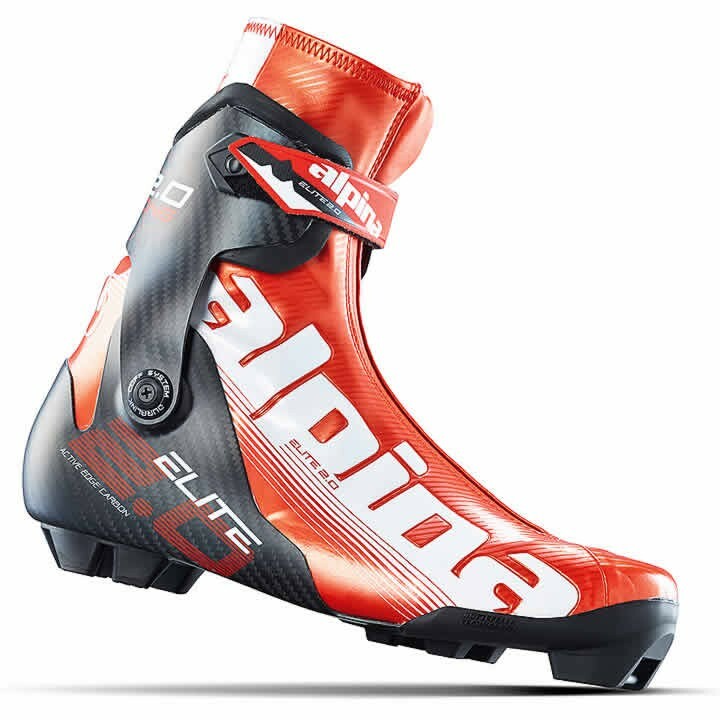 The Alpina ESK 2.0 Nordic Skate Boot features a full carbon cuff and extremely light carbon chassis construction. Designed to meet the needs of elite level athletes, the ESK 2.0 allows racers to push their limits. Skate Active Edge with Alpina SSR Skate Sole: Extremely light anatomic and ergonomic carbon-made Active Edge and hard flex single-piece chassis construction with integrated TPU-made NNN compatible toe and heel plate. Chassis provides maximum longitudinal stiffness and lateral stability, superior responsiveness and power transmission by the foot to the ski, with adaptable heel pocket for optimal foot and ankle fit. Active Edge: Active Edge consists of a special sandwich of inner and outer carbon textile layers combined around a rubber mid-layer for maximum chassis adaptability to various types of heels and heel shapes together wit maximum power and total control. Elastic Insert: For gaiter adaptability to various lower leg shapes. 45° Lacing: A braid angle of 45° relative to the longitudinal direction of the shoe improves the torsional stability of the soft part of the shoe. This ensures a tight fit between the shoe and the foot in the rotation phase of the shoe toward the inner side when skiing the skating technique. Full Carbon: The anatomic full carbon cuff is extremely light and delivers maximal stiffness and superior lateral responsiveness. EVA-padding delivers superior comfort, while the ankle power strap ensures optimal ankle fit and adjustable ankle grip. PVC Gaiter: One-piece seamless, covers shoe and lower leg completely, water-tight, with water-tight zipper, elastic; Protects against cold, water, moisture and snow, shoe instep adaptable to different foot shapes.